It’s that time of year where fiber artists make the mad rush to finish off handmade gifts for family and friends, and even to those less fortunate. Where does the time go and how do we get everything finished in time to mail off the packages? Lets start by making a list of what we want to make. The Mad Rush seems to happen right about now. Every arts and crafts website sending out emails letting you know about some new pattern, new yarn, new crochet hook (or knitting needle). How many emails do you have just sitting there waiting to be opened? If you are short on time and The Mad Rush has got you pulling your hair out, here are a few of my favorite items to knit or crochet. These items are quick to make, and you can mark them off your list. Fingerless Mitts. My mitts are easy for the new knitter, can be modified depending on yarn & techniques you want to add to it. The original pattern uses thick yarn, big needles and just garter (knit) stitch. These mitts are great at keeping your hands warm, and you can still text, you can email and you can drive without taking them off. It is not safe to text and drive at the same time, wear the mitts but leave the phone in your pocket or purse. Crochet Beanie Style Hat. There are many hat patterns out there, and this is one of my favorite designers to use for her hats. It’s a quick and easy pattern. From infant to adult, you can crochet a hat in less than 4 hours. Worsted weight yarn and a 5.00mm hook (H hook), one skein of about 200 yards of yarn. Add a cute pompom to the top, add earflaps and tassles to accessorize it. Sarah’s patterns are easy to follow, with size changes, additional rows, her cute animal hats are fun to crochet. Knit Hat. I cannot leave out knitters when it comes to hats. The As Good As Gold hat uses a chunky yarn like Lion Brand Hometown yarn or Lion Brand Wool Ease Thick & Quick yarn, size US 15 circular needles in 16 inch length. With knit and purl stitches and some decreases to close the hat, you will have a big chunky hat just like snowboarders wear on the slopes. Crochet Scarf. Rolling Along scarf is a quick pattern that uses 1 cake of Sweet Roll yarn, 245 yds, worsted weight and 5.50mm I crochet hook. The V Stitch pattern is easy to memorize, and in no time, you have finished a scarf. The pattern states it is an infinity scarf, no ends to weave in. Modified if you want to add fringe to the ends of the scarf. Knit Scarf. For knitters, if you do not want to use worsted weight or heavier yarn, the Light and Lacy scarf will work for you. Knit with #3 weight yarn, YO and K2tog are the stitches used to make a pretty scarf. Cast on more stitches, more yarn and you can have a lovely knitted wrap to wear. Add sparkly yarn to dress up an outfit. Crochet Animals. What child does not like stuffed animals. I like to give stuffed animals to new moms as part of their baby shower gift. Bright colors, soft to the touch, machine washable. Elephant is my favorite animal to make. One of the first animals I learned to crochet in the round (amigurumi). Water Bottle Carrier. 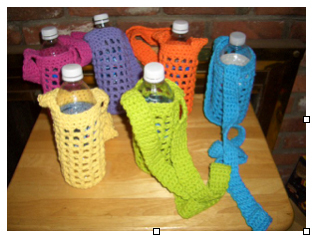 This is a fun cozy to crochet for those that do not like to hold a bottle of water. One of the first patterns I designed over 8 years ago. Made with cotton yarn, it will hold a bottle up to 24 ounces, even those metal bottles will fit. Using less than 1 skein of cotton yarn, an H hook and in a few hours you will have finished another gift to give. The Mad Rush is on, by showing you that there are items that can be made quickly, you will in no time have your list finished. Enjoy your crocheting and knitting, but remember to always take time for yourself. Happy Holidays to you and your family far and near. A scarf is a great accessory to add to your outfits. The Light and Lacey knit scarf is one you will want to try. This pattern will get you started on many projects for the cooler months ahead. The scarf is knit with larger than recommended needles to create open, airy stitches. With a 1 row repeat, you will be knitting it in no time. Just pick your yarn, grab needles at least 1 or 2 sizes larger and get ready to knit. Choosing the right yarn really makes a difference. I chose a light weight yarn, Lion Brand Shawl in a Cake, 5.3 oz, 150g, 518 yds. Why? Because of the long gradient color changes that happen. When you pull from the center of the cake, and cast on the stitches and begin to knit the pattern, you can see the color changes slowly. With gradient yarn, I like to match the colors, so they are uniform, as you can see from the photos..
You will only knit half of the yarn. The pattern is adjustable, cast on more stitches for a wider scarf, even more for a wrap and knit up the entire cake of yarn. The sample shown was knit with size US10 straight needles, or use circular needles, 24 inches in length. The scarf measures 6 ½ inches wide by 90 inches long, because of the light and airy feel to the scarf, I wanted it to be long. It is your discretion to knit as long as you like. Weigh the yarn with a kitchen scale before you begin, and then weigh the cake again to get to the 2.65 ounces remaining. With the remainder of the cake, you can always knit another scarf, give as a gift to a best friend, make one for a child (mommy & me matching), or give to a charity to the less fortunate. Either way, 2 scarves for 1 price not bad. So here we go for the instructions. There you go, a nice and easy scarf pattern that is light and lacey. You will be making these in no time. Take your time to get comfortable with the yo, k2tog. As a reminder, you will have 3 (K) stitches on both edges and 9 (yo, k2tog) clusters in between the knit stitches. Feel free to post photos to your social media with hashtag #yarnkat as the originator of this pattern. Please do not share this pattern or copy the photos from pattern. You may post the link to the pattern back to me. Written pattern copyright Kathy Bartholomew © 2018. Please do not reprint or repost this pattern. You may sell items made from the pattern. Photos are property of YarnKat and Kathy Bartholomew. The Los Angeles Yarn Crawl, is an annual opportunity to discover local yarn shops one has never been to but want to visit. It is a 4-day romp around L.A, from as far east to Claremont, north to Santa Clarita, south to Long Beach, and west to Santa Monica and stores in between, 26 stores including a mobile shop. The guide to get you from shop to shop. Color coded groupings of shops along the freeways, you could navigate your way with ease. Plus the map ensured you made it to each shop. Your guide to the location of the shops, are also grouped together. Once you got to the shop, your passport was stamped and a collectable pin was given to you. A way to make sure you did visit all the shops in the group. Plus a FREE Knit and Crochet pattern. A Win-Win already. One must have something to carry all that yarn in, right? This year’s bag is an extra large natural canvas, with long handles; the chic sheep wearing his sunglasses and hat. Each store had a drawing for one of the large gift baskets full of yarn, needles and more from the Super Sponsors of the Yarn Crawl. Some stores even had daily raffles. 4 days, 26 yarn shops, navigating many Los Angeles freeways, what could be better? The Grand Prize. The Grand Prize, if you visit at least 1 shop in each of the regions and turn in your passport, is STITCHES SoCal 2018 VIP Prize Package, which includes up to 24 hours of classes, VIP seating at the Fashion Show and Fashion Show Dinner, VIP seating at the Student Banquet & Style Show; All Access to Stitches So Cal 2018 Market; Hotel Room at one of the host hotels Wednesday thru Monday. What a great grand prize, and because its in So Cal, what a great opportunity to go to a Stitches conference. This was the first time to attempt to get to all 26 shops, not in the super speedy 2 days that some crawlers did it, but within 3 days. With a few bumps in the road to start the crawl, I was able to shop 4 stores on Thursday. Lee drove me the rest of the crawl, Friday through Sunday, I navigated the freeways for him. We hit all the stores, and yarn was purchased. I had a goal in mind, I knew what I wanted in yarn, planning ahead for crochet animals. I was able to find some yarn for the animals, lovely bright colors. Found yarns for larger animals, and even found a few items that are not yarn, but yarn related like the Wool Light I picked up at Creative Ewe in Santa Clarita. We had a great time traversing the vast freeways to shops far and near. Yarns I purchased, like Noro, Encore Chunky and Mega, and Cascade Yarns Anthem are new to me. Now its time to get back to crocheting, crafting, designing and planning. Merry Holidays and Cyber Monday to you all. Thanksgiving has come and gone. Leftovers were eaten, and the belly was full. YarnKitties enjoyed their little turkey dinners too. Now its crunch time for my 3 upcoming holiday events. I am busy crocheting animals the next 2 weeks. Then I can relax for the remainder of the year. Just a heads up, YarnKat moves to another web host site soon. It will be down starting Dec 3 thru Dec 12th as we migrate from one hosting service to another. However, you will still be able to reach YarnKat through the YarnKat social media accounts. As my gift to you for your patience, please feel free to take 50% off each pattern listed. This is a limited time offer, so grab those patterns while you can. Thank you for your continued support of YarnKat.